The Philips BASS+ Truly Wireless retail for $130. One of the standout trends at IFA is the number of companies flinging themselves onto the Truly Wireless earbud bandwagon. It's clear that it's not just a niche product that Bragi and Samsung are catering to, but an audio product for everyone. Because the latest company to throw a hat into the ring is none other than mass-market experts Philips. Philips is one of the world's largest audio manufacturers, with a reputation for being stuffy, unsexy but dependable. The company is looking to change some of that, however, pushing a new range of audio gear that includes the BASS+ line, which includes the BASS+ True Wireless Headphones. The headline point of which is that you can get premium-style Bluetooth earbuds for just $130. The biggest difference between many of its rivals and the BASS+ buds is that they're significantly larger than the rest. 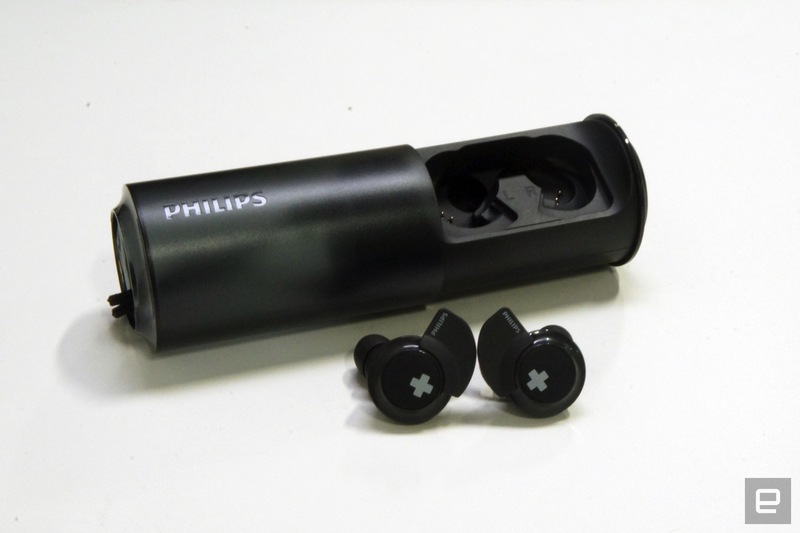 Philips believes that shrinking the driver and placing it into the ear tube itself compromises the sound you can get. As a consequence, the company has seen fit to include an 8.2mm driver in each bud with the promise of "big, bold bass." Trying the device very quickly during the trade show, it's clear that the bass is a little louder than Philips' rivals. But the audio quality is otherwise equal to several other high-end headphone brands, and the company's experience here clearly shows. We'll reserve judgment for now, but there's reason enough to be excited about the BASS+' potential. Battery life is another big selling point, and those larger bodies make for larger batteries, with a promised run time of up to six hours. The charging case, meanwhile, has an on-board battery that can hold one full charge, meaning that you can get half a day out of these before heading to an outlet. Even wearing them for just a few seconds, the fact that the BASS+ has hard buttons rather than a touch panel is going to be an issue. Because as you push the button into your ear, you can feel the rubber tip scrape against your ear canal with the additional pressure. But given the significant drop in price compared to other versions of this technology, it may be the cross you have to bear.